Pie Vertigo, originally uploaded by arahbahn. My body reminded me yesterday that it’s in charge, in two ways:. A deep, deep sleep and the sofa nearly consumed me, once I got the cake in the oven, after a full day of work, a trip to the comic shop for my fave comic, dinner at the ‘Tap, then making 1 batch of peanut butter biscotti and 1 batch of Ecuadorian quinoa soup. Thankfully, timer and husband kept me from a full submission that would have destroyed the cake and possibly also the evening and house. The second instance of my body steering things, yesterday: I skipped my ski class, mostly due to concern over getting all of the above done in addition to attending the 6:15 pm class. Around 4pm I got a headache and a few other hints of exhaustion. I hadn’t gotten a normal night’s sleep since Friday. Oh, I love cooking. Way more than skiing, and possibly more than exercise out in the cold. At least, today. 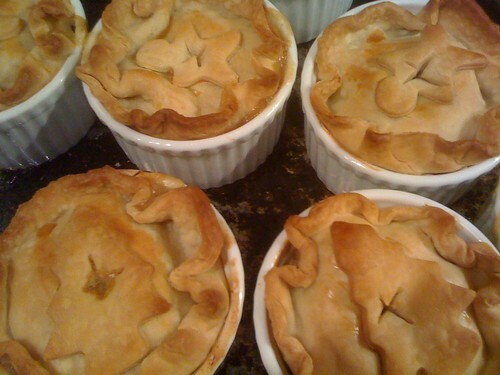 Above is a shot of the tourtière I made on Saturday, which turned out so well, if even cute. The holiday cookie-cutter tops were a last addition, to use up dough. I figure, this is normally a Christmas-eve meal, anyway. Why not? I very rarely use the cutters, anyway. Wow, does that picture make me hungry!